5.7 m. of textual material. Whitby was incorporated as a Village through a proclamation effective March 11, 1852 under the terms of the Baldwin Act, Chapter 81, Canada Statutes, 1849. In 1855, Whitby was incorporated as a Town made up of the three small communities of Port Whitby, Perry's Corners, and Hamer's Corners. Whitby's primary industry of the 19th century centred around the harbour and the transportation of local grain and lumber across Canada and to the United Kingdom. In 1968, the former Town of Whitby amalgamated with the communities of the Township of Whitby to become known as the Corporation of the Town of Whitby. The Town of Whitby includes the Village of Brooklin and the hamlets of Ashburn, Myrtle, and Myrtle Station. Records were transferred from the Office of the Town Clerk. 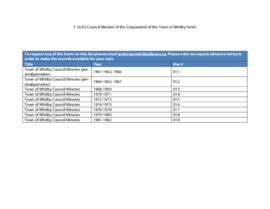 Fonds consists of records which document the administrative functions of the Town of Whitby. Fonds is comprised of the following series: Original By-laws and Council Minutes. Access to all records in the fonds is governed by the Municipal Freedom of Information and Protection of Privacy Act. Use of these records is governed by the Archives at Whitby Public Library Access Procedures. Although the majority of the records in the fonds can be reproduced, the Archives reserves the right to refuse to copy records which are fragile or which are subject to restrictions under Freedom of Information and Protection of Privacy legislation.